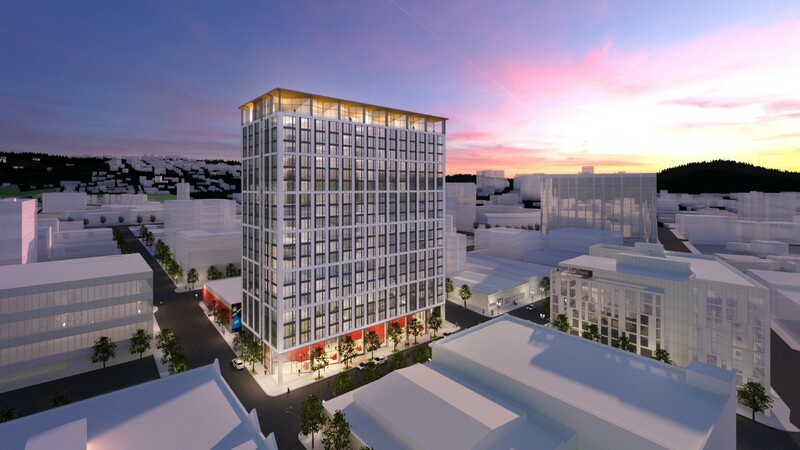 The 304 unit ART Tower is proposed for the north half of the Artist Repertory Theatre block in Goose Hollow. Every week, the Bureau of Development Services publishes lists of Early Assistance applications, Land Use Reviews and Building Permits processed in the previous week. We publish the highlights. This post covers July 2nd to July 8th, 2018. Convert a warehouse/storefront building with existing church use into a six (6) one-bedroom loft style residential units with shared and private courtyards. Courtyards will be created by removing portions of existing roofing. 20% unit density increase to be achieved through amenity bonuses. New 3-story pavillion connecting the existing North and South Portland Art Museum Buildings. There will also be a new loading area along SW Jefferson St, which requires a separate driveway design exception (per PBOT). Construction of the Navigation Center, a short-term shelter and resource center for Oregon Harbor of Hope. Proposal to demolish portion of existing building on nw quarter of the block and surface parking lot at NE quarter of the block. New construction of 21 story mixed use residential building on the north half of the block. Retail, lobby and amenities at the ground floor. Parking below grade. Renovation of existing retail mall anchor to accommodate multiple tenants, increasing the existing height by one story. The renovation includes the SW corner of the existing mall known as Block A and the exterior facade remodel and plaza/yard improvements on the south, west, and north sides of existing building. One modification requested to the bicycle parking standards.